Nutritional needs of grapevines are assessed by a combination of soil testing, and plant tissue analysis. Soil testing helps in monitoring changes in the soil pH, nutrients, and organic matter levels over time. To compare soil nutrient changes over time, it is best to soil sample at the same time of the year. Spring is a good time to test the nutrient levels in your vineyards. Soil sampling before planting and after establishing vineyards are essential for establishing good nutrient management plan. Test your soil at least about three to six months in advance before planting so that there will be sufficient time to apply fertilizer and lime treatments to provide a favorable environment for grapevine growth and establishment. Lime takes about three to six months to react with the soil to raise the soil pH. Likewise, if your soil has very high pH you may have to apply elemental sulfur to reduce the pH. This is a biological reaction and will take about the same time like lime to make changes in soil pH. Soil testing on a regular intervals following establishment (once in three years) is important in determining and maintaining desirable soil pH in the upper few inches of soil. At pre planting, it is recommended to take a separate sample at 6 inch depth and another sample from 6 to 12 inch depth. As roots will explore larger volume of soil it is important that the second depth is used to make sure sufficient nutrients and lime are applied before planting. On established vineyards, taking the surface 6 inch depth sample is sufficient. Taking a representative sample from the vineyards is an important step in soil testing. Use a soil probe, trowel or spade to take sample. First use the map of your vineyard to divide the area into smaller sections with similar soil texture, color, drainage, slope and prior cropping history. When sampling, avoid bunds, big stones, ends of the rows, and boundary area of the field. Mark the areas you are sampling in the map so that you can sample the same areas to monitor the nutrient status over time. Take a minimum of 10 to 15 cores in a zigzag fashion from every five acres. 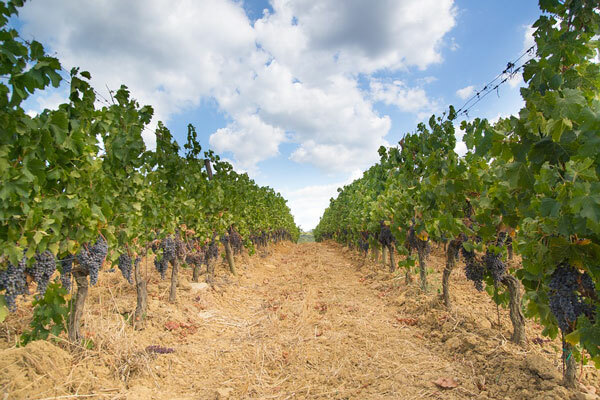 If your vineyard is uniform you can take 15 to 20 cores per every 10 acres. Make sure to collect samples at 6 -inch depth by taking multiple cores as recommended from each area, collect it in a clean bucket, mix the samples very well and take one and a half cup full of the homogenized sample and submit to the lab. A regular fertility test package that includes pHs, P, K, Ca, Mg, organic matter, neutralizable acidity, estimated CEC with recommendations should be selected for analysis. University of Missouri Soil and Plant Testing lab provides soil, plant, water, compost, greenhouse media and manure analysis. 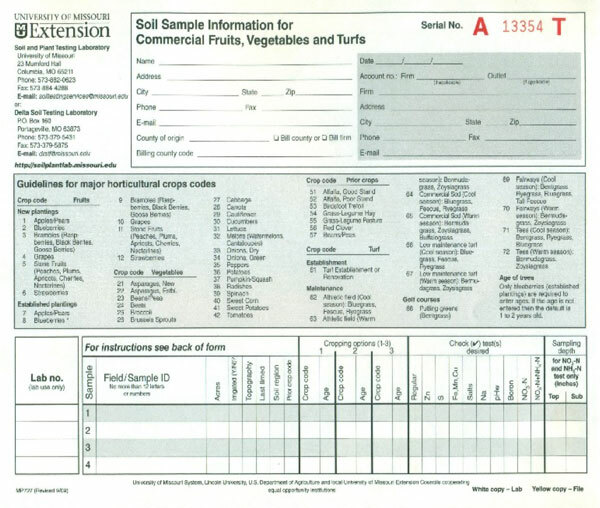 Sample submitted to the lab should be accompanied a by a duly filled soil sample submission form for "Commercial Fruits, Vegetables and Turf" (MP 727). Samples can be submitted via County Extension Centers or directly to the lab. When submitting samples directly to the lab, payment by check for the amount due written in favor of "MU soil testing lab" should be mailed along with the sample. Information on taking a representative sample, sample submission forms, and how to submit samples to the lab can be found at the lab's website at: http://soilplantlab.missouri.edu/soil/.